Equinus...I have a horse foot? It is a condition that is common to horses because they walk on their toes, but should not occur in people because of the problems it causes with our feet. Equinus can increase pressure on the front of the foot because of the limited motion at the ankle. This can cause pain, calluses and even ulcers or open sores if you are a diabetic. Treatment can be conservative, range of motion exercises and therapy, or surgical to release the contracture of the leg muscles and tendons on the back of the leg. 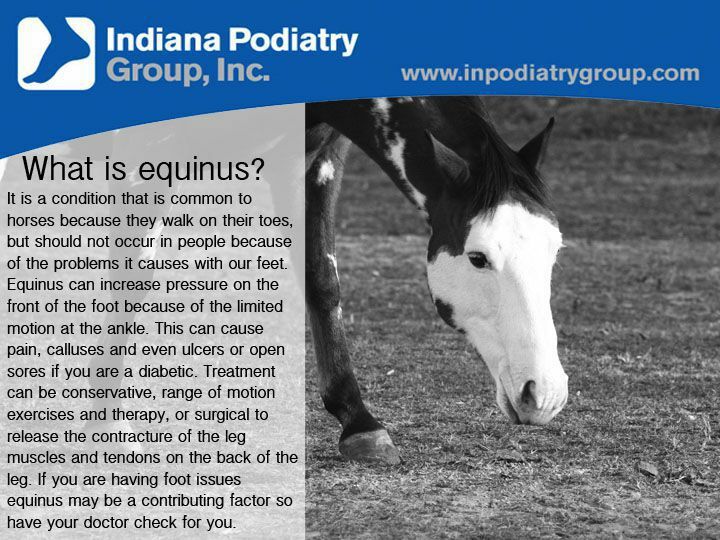 If you are having foot issues equinus may be a contributing factor so have your doctor check for you.